Through much of the sixteenth century, Europe was at the hub of a religious revolution. This period, known as the Protestant Reformation, was characterized by self-proclaimed “reformers” who protested the medieval practices and beliefs of the Roman Catholic Church. The Reformation was a western European movement “which sought to return the western church to more biblical foundations in relation to its belief system, morality and structures.” The emphasis during this era was not on the inspiration and inerrancy of the Scriptures, as during medieval times, as much as it was on their sufficiency. Much of the debate during the Reformation concerned “the role of Scripture in determining Christian theology.” The Lutheran and Reformed, or Calvinist Protestants, argued for the need to return to Scripture as the chief source of Christian theology. These reformers were not interested in establishing a new Christian tradition, but making corrections to the existing one. During this era, the Protestant reformers were under mounting pressures to articulate a theory of the church that would justify their break from the Roman Catholic Church and prove the sufficiency of scripture alone as the basis for Christian living. The Lutheran movement was initially an academic movement concerned with reforming the theology of the University of Wittenberg; furthermore, through his first literary work, he had no other intentions other than to edify the congregation he pastored and lead them to Christ. Luther’s full-blown Reformation conception did not occur until after he posted the Ninety-five Thesis upon the Castle church door in 1517 in hopes of triggering a debate on the system of indulgences that had long been the practice of the Roman Catholic Church. “The events which followed the publication of the Ninety-five Theses had not been anticipated by Luther. Instead of instigating a scholar’s debate, the Theses were surreptitiously translated into German and widely disseminated.” The widespread circulation of Luther’s controversial writings on the abuses of the Roman Catholic Church gained Luther much support among the people and hence began the Lutheran Reformation in Germany. Martin Luther also rejected the supreme authority of the Pope stating, “I put no trust in the unsupported authority of the Pope or of councils, since it is plain that they have often erred and often contradicted themselves.” His theology can best be summed up as Christ and Christ alone. In his central theme, “justification by faith through grace” (Eph.2:8), he “ruled out every attempt to justify or acquit oneself before God” through “a prescribed combination of sacraments and works.” Concerning the sacrament of the Eucharist, Lutherans diverged less from the Roman Catholic Church’s sacramental theology than other Protestant groups. Although both Roman Catholics and Lutherans agree that the body and blood of Christ are truly present in the Eucharist, Lutherans maintain, contrary to the Roman Catholics, that the elements in the bread and wine do not change into the body and blood of Christ. The integrity of the consecrated elements remain, and are instead united with Christ—“the body and blood of Christ are truly present, and they are truly distributed and taken together with the bread and wine.” Lutherans call this a sacramental union. Overall, the Lutheran Reformation transformed the Christian landscape in Europe and aspects of Luther’s theology have had a deep impact upon western Christian thought. Swiss Reformer John Calvin and other Reformed theorists were just as influential, although Calvin was more concerned with reforming the morals and worship of the church and less concerned with the doctrinal reforms sought by the Lutherans. French Reformer and theologian John Calvin was an important figure during the second period of the Reformation. 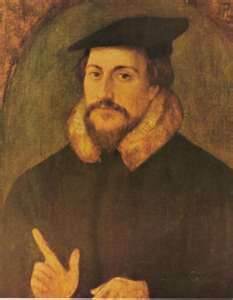 Calvin, like the Lutheran Protestants, broke away from the Roman Catholic Church as a result of many abuses in the church. Calvin and his followers rejected the authority of the papacy and argued for the witness of the Holy Spirit to give full authority to the Scriptures. Calvin maintained that “the authority of Scripture is founded on its being spoken by God. This confirmed by the conscience of the godly, and the consent of all men of the least candor.” Calvin was concerned with presenting a clear theological system that would set out the basic ideas of evangelical theology and did so in his lifelong work, the Institutes of Christian Religion. “The Institutes was not only the classic of Christian theology; it was also a model of Christian devotion. For what Calvin sought to foster was that “pure and genuine religion” which consisted in “faith united with a serious fear of God.” Through his theologically oriented works, Calvin has been described as a systematic genius. In other of Calvin’s writings, his doctrine of predestination came to be characteristic of the Reformed church. Although Calvin honored the doctrine of justification by faith largely associated with the Lutheran Reformation, he initiated a trend in discussing the grace of God in relation to the doctrine of predestination, rather than justification. For Reformed theologians, the “ultimate statement of the grace of God was not to be seen in the fact that God justified sinners, rather, it was to be seen in God’s election of humanity without reference to their foreseen merits or achievements.” The doctrine of predestination sharply distinguished the Lutheran Protestants from the Reformed. Above all, Calvin was a serious student of Scripture and an excellent theologian. His expositions on the Scripture and articles of faith, alongside his work to establish sound canons of interpretation for exegetical study proved to be of great profit to the church. Because of Calvin’s labors, the Reformed church gained great momentum in Europe, and by the time of his death, had gained international notoriety. 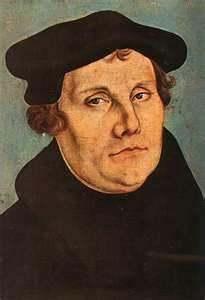 Calvinism had superseded Lutheranism, which during the Reformative era had not gained ground past the borders of Germany. In all, the reformers, Luther and Calvin, covered a broad agenda which centered upon improving Christian theology in an era widely regarded as one of the most creative in history. Alister E. McGrath, Historical Theology: An Introduction to the History of Christian Thought. (Malden: Blackwell Publishing, 1998), 156. `Douglas R. Cullum, “BHT 512NE, The Era of Correction: Reformation and Revival in the Church,” 24th ed., (Northeastern Seminary), 36. “In the aftermath of the Diet of Worms (1529), which voted to end the toleration of Lutheransim inGermany, several princes and cities rose up and protested against the oppressive measure, defending the freedom of conscience and the rights of religious minorities. The term “Protestant” is derived from this protest. “ McGrath, 159. Martin Luther, Good Works, The Occasion of the Work, para 1. Christian Library. Heritage Edition, Version 8, (Rio, Wisconsin: AGES Software). Martin Luther, Selections from His Writings, ed. John Dillenberger (New York: Anchor Books, 1962), Introduction 25. Luther, Selections from His Writings, Introduction 12. Luther, Good Works, Introduction, para 1. By Luther’s time, misrepresentation and misunderstanding led people to believe that indulgences were a quick and convenient way of buying forgiveness, McGrath 160; Luther, Selections from His Writings, 20. Luther, Selections from His Writings, Introduction 21. Harry Bettenson, Documents of the Christ Church, 2nd ed. (New York: Oxford University Press, 1999), 282. Philip Schaff, The Creeds of Christendom: The Evangelical Protestant Creeds, Vol. 3. (Grand Rapids, MI: Baker Publishing Group, 2007), 137. John Calvin, Institutes of the Christian Religion, Book 1, Chapter 7. Christian Library. Heritage Edition, Version 8, (Rio, Wisconsin: AGES Software).